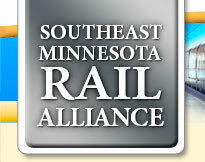 Contact Tim Geisler at 507-284-5752 or info@SEMNrail.org. If you are a business or organization interested in a presentation, please contact Marcia Marcoux at 507-288-4263 or Marcia@SEMNrail.org. If you are an individual who wants to become more involved, sign up here.